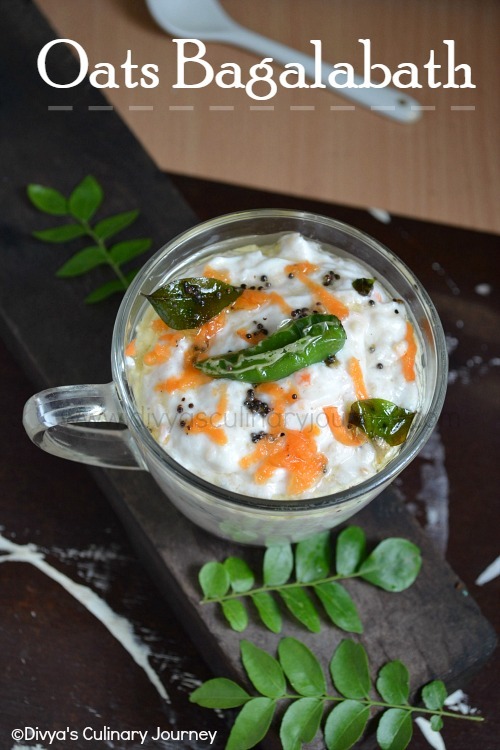 Oats Bagalabath is nothing but oats prepared in thayir sadam style - Oats is cooked, mixed with curd/ yogurt and is seasoned. 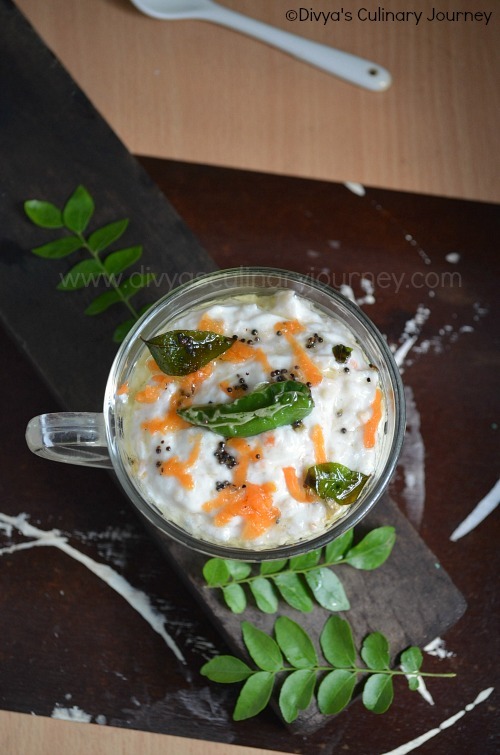 Very simple and easy to make dish yet it is very delicious and hearty. I had got oats long time back and was waiting to try different recipes with it. Since I went into blog hibernation, I was putting it off. Suddenly got this idea and prepared this for my breakfast. It just took few minutes and it was ready. This can be had any time, breakfast or lunch. I also wanted to blog about it here. 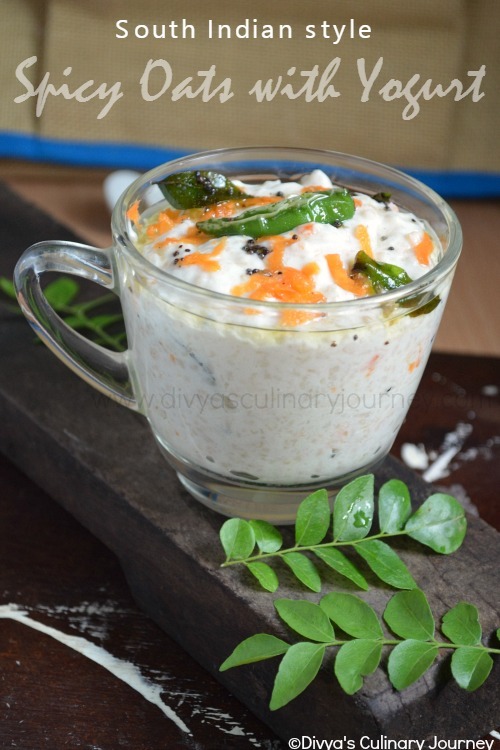 So you can expect some healthy south Indian oats recipes here. 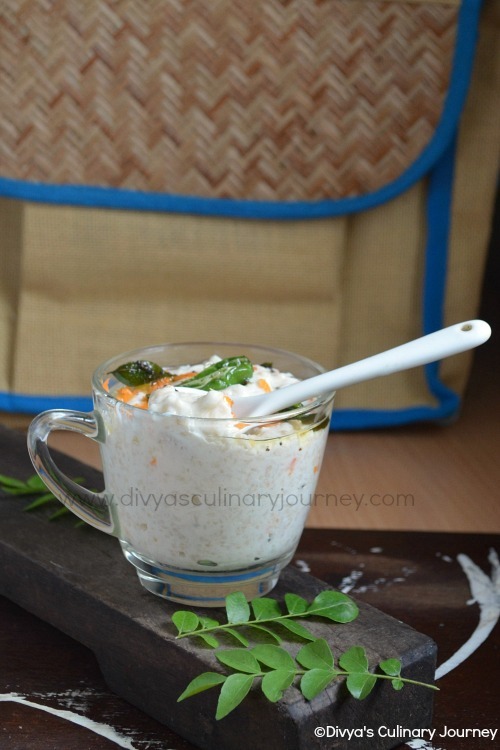 How to make Oats Bagalabath? In a pot add half cup of water along with 1/4 cup of oats and cook in medium flame till it is done. It will take 2-3 minutes. Alternatively you can microwave them in a microwave safe cup for couple of minutes. Let it cool. When it is completely cooled mix it with yogurt and salt. Then heat oil in a pan, add mustard seeds, when they crack add green chilli, curry leaves and grated ginger and fry for a minute or two. Then add asafoetida and turn off the heat. Add this tempering to the oats and yogurt mixture and mix well. You can garnish it with grated carrot and chopped cilantro as needed. I have used half cup of regular yogurt. You can use low fat yogurt. If you are health conscious you can skip the tempering part(step 3 & 4). For garnishing I have used grated carrot, you can also use pomegranate seeds, chopped raw mango, chopped & de seeded grapes etc., Choice for garnishing is endless. You can choose as per your taste. Such a filling lunch ..Props and clicks super ..
healthy meal.. I love it too.. I make it as kanji ..